My little sewing machine finally has a pretty cover, it’s not fancy but I love the fabrics and it came together quite easily. 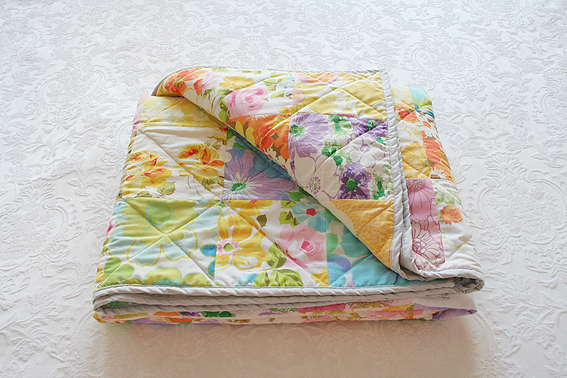 I didn’t follow a pattern, it’s a simple reversible cover with two box corners on top. It’s roomy in case I one day upgrade my almost 20-year-old Singer. 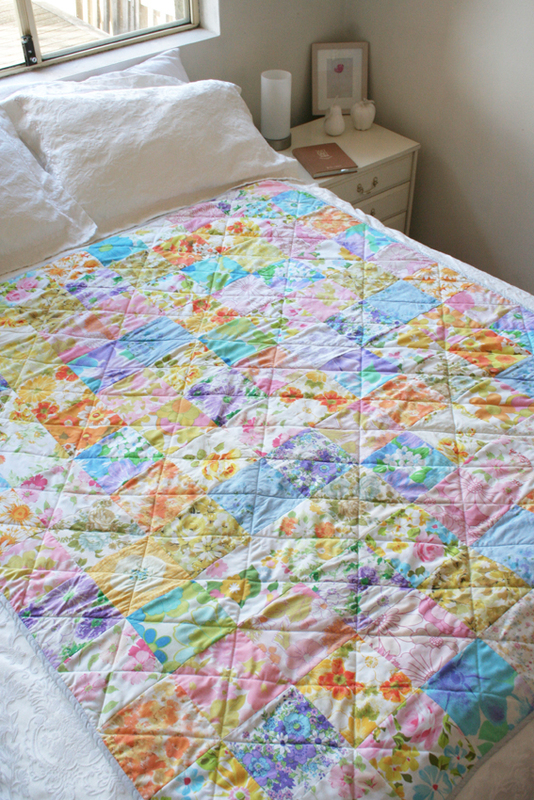 The fabrics are vintage sheets that have been sitting in my drawer for way too long. They need to be free! Now I can see them everyday in my craftroom bedroom. 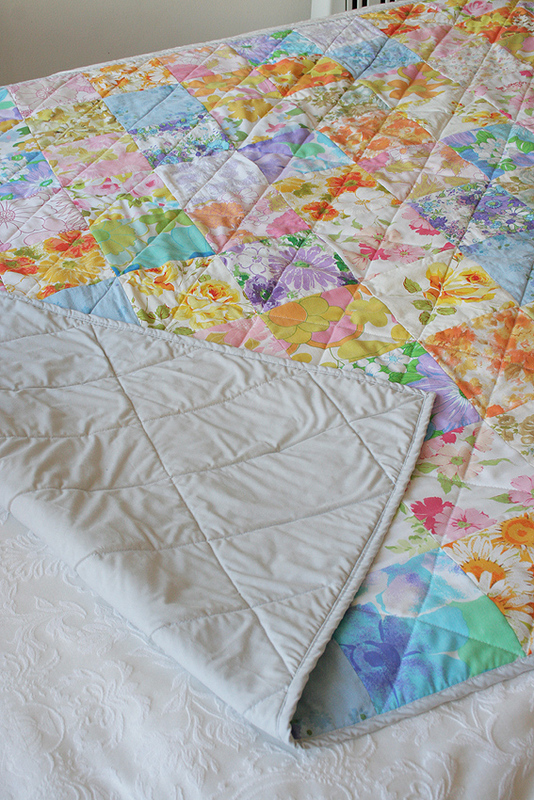 I’d love to make another quilt with them, but for now this project was nice and quick and stress-free. How many of these fabrics are originals? I’m not too sure. Some may be reproductions but I don’t really mind. I purchased most of these fabrics as fat quarters on Etsy some time ago, but did manage to pick up a few colourful sheets in good condition from my local op-shops. 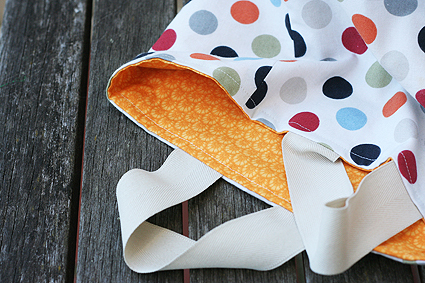 Actually, now I think of it, the first sewing machine cover I made as a teenager was from an old pillow case. Long before I knew anything about vintage sheets. 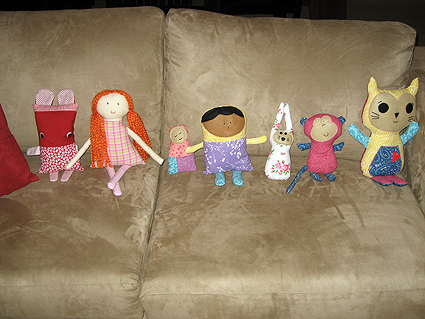 And long before they were so popular in the online crafty community. Heck, it was before I knew what the internet was. I was before my time, I tell you! The inner lining is also a vintage sheet (blue and purple floral above) but the patchwork side is just too colourful to hide away. 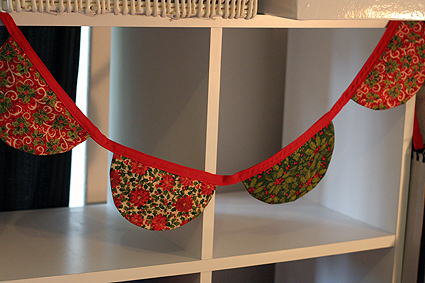 I made a little bunting to match (I was on a roll), because we all need a little bunting in our lives. How did we cope before bunting was everywhere? Long live the bunting. 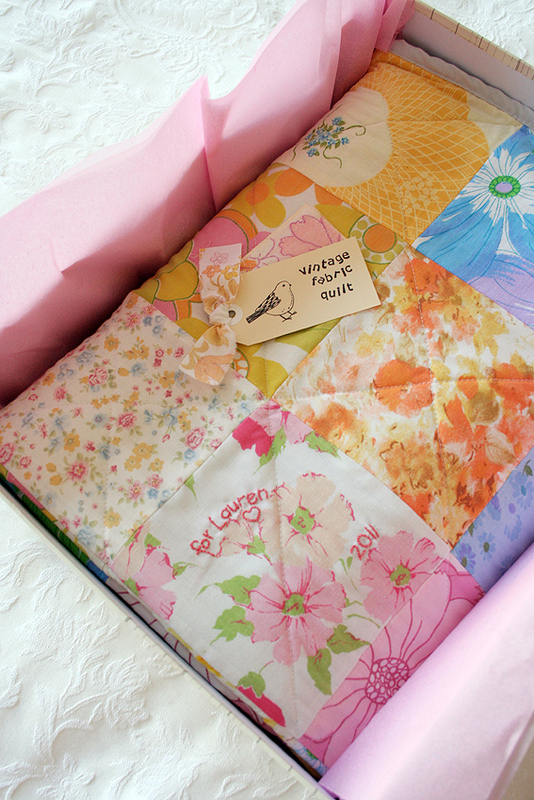 And the supply of gorgeous, colourful, printed vintage sheets. For more vintage sheet deliciousness check out my friends at Amelie and Atticus and Oh, Hello Henry! 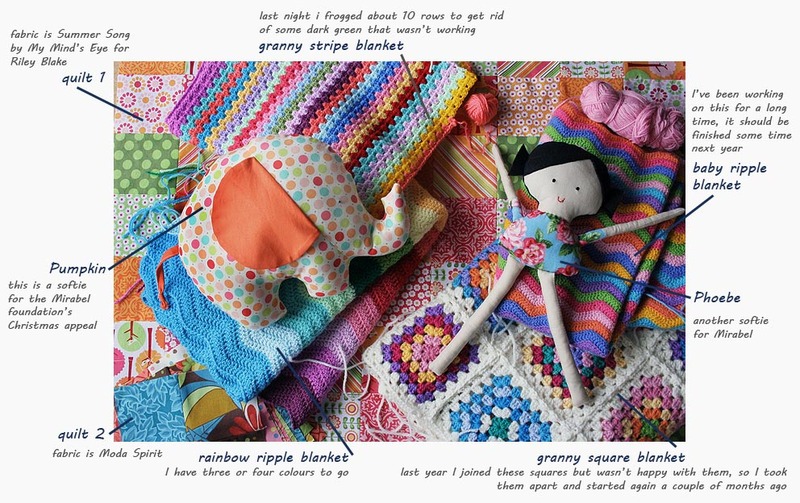 Thouraya made a gorgeous range of little quilts from her rather sizeable stash of vintage linens. Hop on to Soho Mode to spy some cute, retro dresses and look at Rae’s sweet ensemble for a little one. 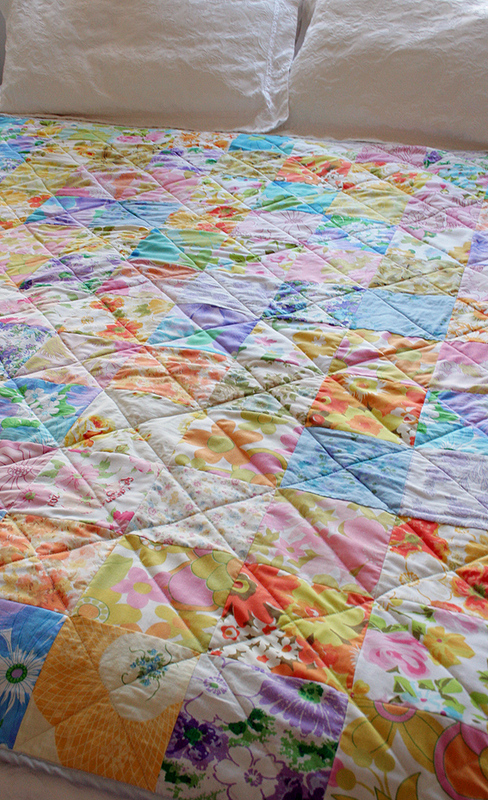 I just love equilateral triangle quilts at the moment. 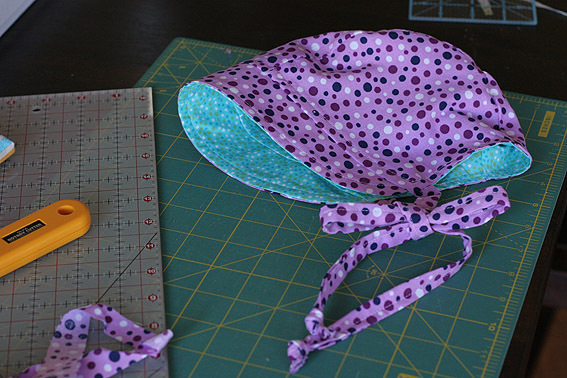 Only problem is triangles are not easy to sew together accurately (well, for me anyway!) and that does not sit well with my perfectionist tendencies. I did my best, and this little quilt didn’t turn out too badly. 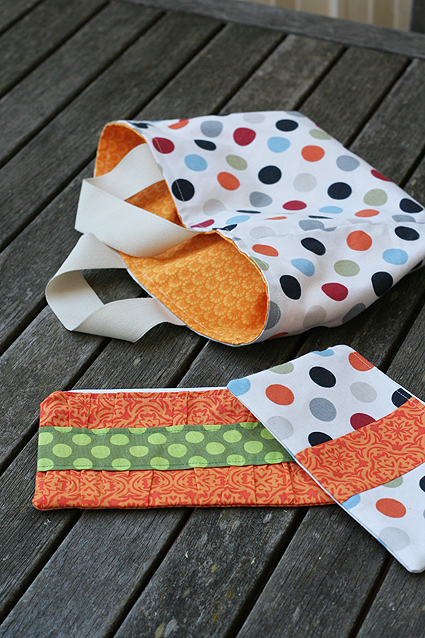 The solids are fun and modern and a nice change from using a set fabric range. It’s inspired by this cute nursery featured on Apartment Therapy and is for a baby boy due in September. Baby boy’s mum doesn’t read Katie’s Kitchen. Or at least, I don’t think she does. Check out more triangle quilts on my Pinterest board. How can it be that 21 years have passed since I was eagerly awaiting news of my baby cousin’s arrival? She’s still my baby cousin, even though she’s about to turn 21, is taller than me and has moved out of home. She’s funny, kind-hearted, curious and clever. She’s a redhead like me even though she has often tried to hide it. She’s gorgeous, especially when she laughs. She’s loved by many. She’s destined for big things. I’m excited to see what her twenties bring. Happy 21st birthday Lulu. It’s been far too hot this week to bake — a week of 30-plus degrees Celsius. The most I managed was a tray or two of kitchen sink cookies with dough from the freezer. 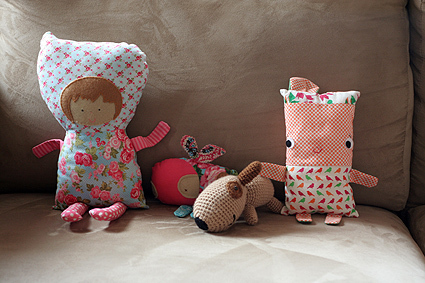 I have been sewing this weekend, even though my sewing machine is in the hottest room in the house. 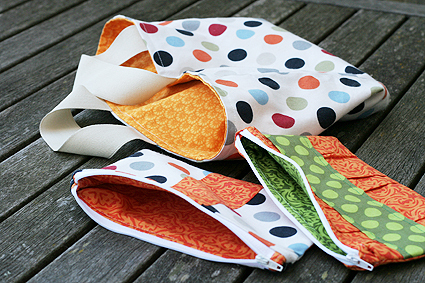 I made this cotton lunch bag for my friend Michelle’s birthday and two zip-up pouches for no one in particular. I do sometimes stress over what to make for people. Some are easier to make for than others. 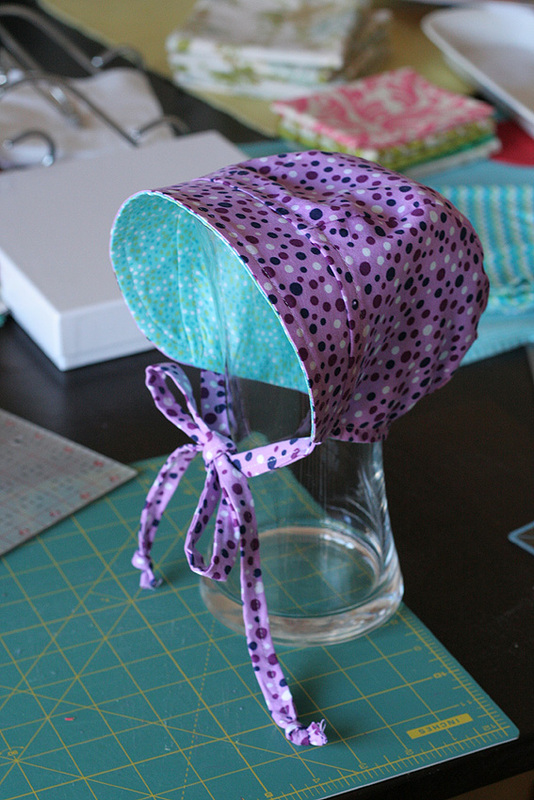 I’m sure other crafters go through it: What should I make? Will she/he like it? Think it’s naff? Use it? Appreciate it? Think “Not another homemade Katie gift!”? I do take pride in my craft and won’t give away something I’m not happy with. My sewing is improving, I’m happy to say. I’m working on an (unpictured) quilt at the moment, which is testing my skills. But I love the fabric so much I’m determined to do an OK job. I’m planning on giving it as a gift; so again, will she like it? Appreciate it? Use it? I do try hard to match the present to the person. 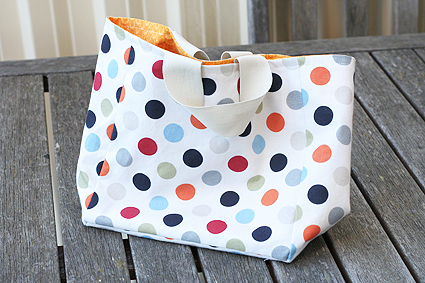 I bought the spotted fabric specifically for this project. The yellow is from my stash. The original pattern called for vinyl-coated cotton but my version is all cotton. 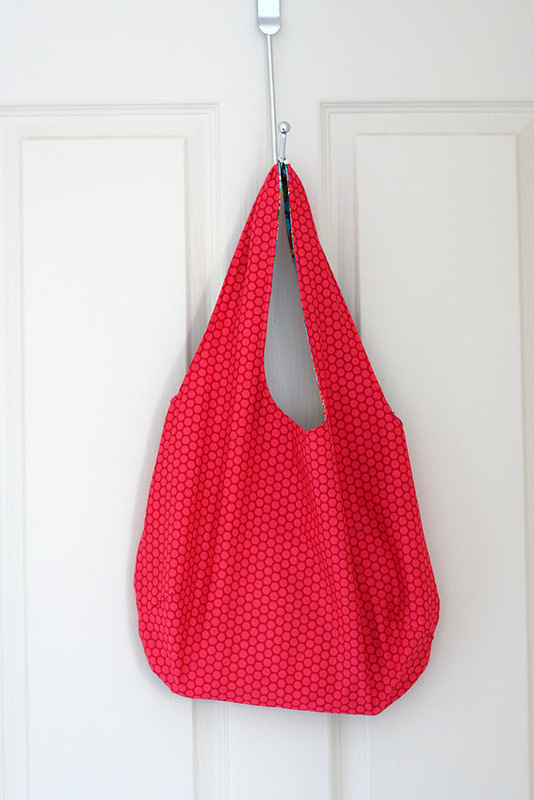 It wasn’t until I finished the bag that I realised it is reversible. 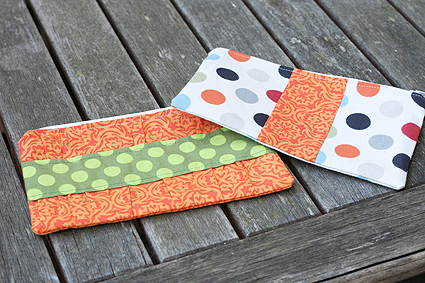 The one on the left was made with a gathered clutch tutorial found on Noodlehead. On the right is my variation. 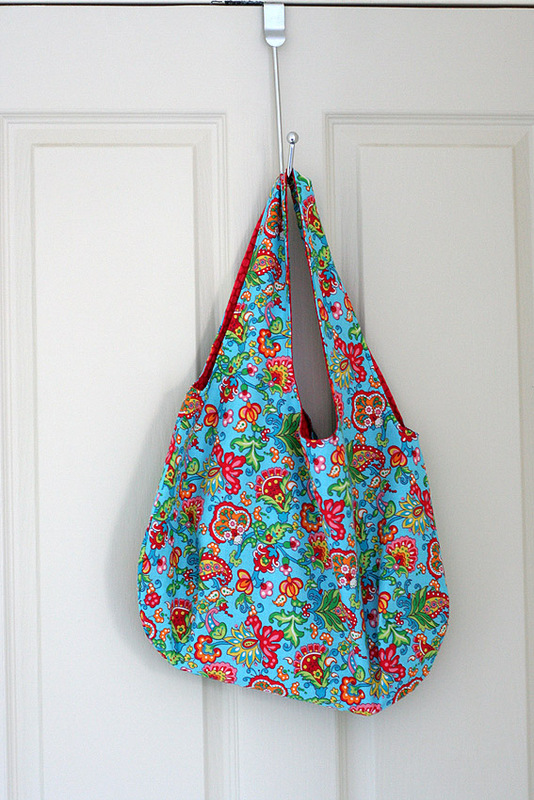 Pattern for lunch bag by Ellen Luckett Baker. 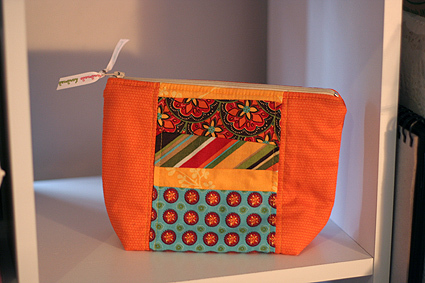 Scrappy makeup bag pattern here. First time doing a zipper! (properly anyway) Took a few goes. 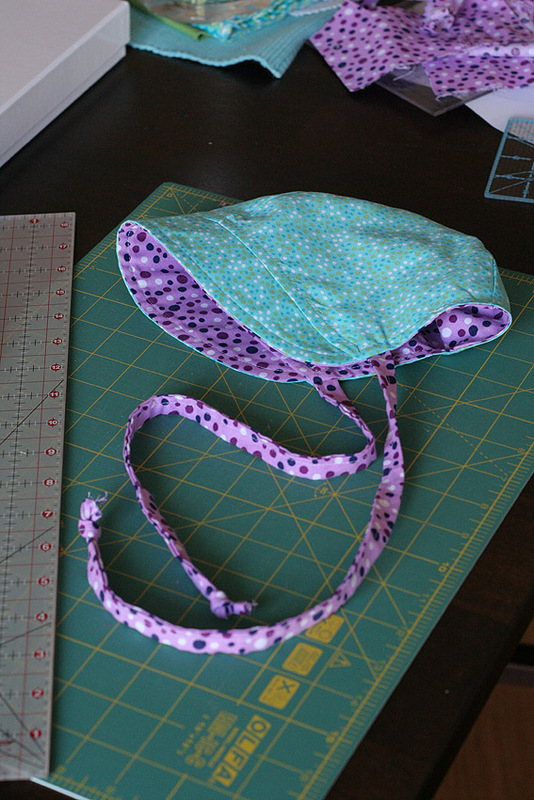 The scraps weren’t supposed to look so straight – opps, it looks like I sewed the second fabric from the top crooked but really the blue fabric turned out too straight.